San Francisco is chock full of Edwardian apartments like the one we rent, and most of them have these lovely recessed shelves in the hallway. The best I can figure, these were used for old intercom systems or phones. 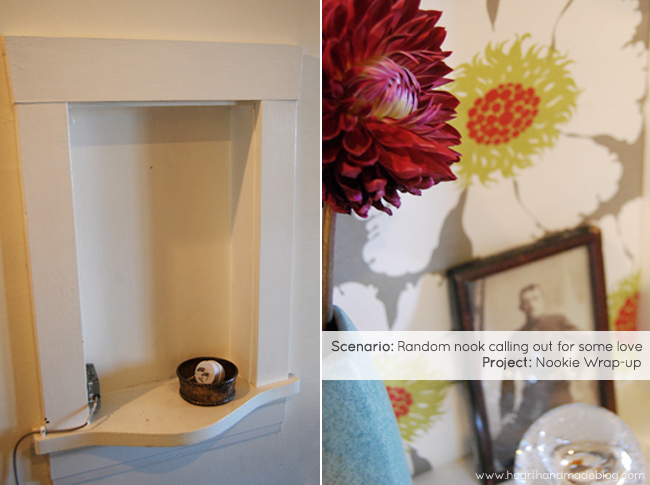 Our hallways is the darkest part of our otherwise bright apartment, so this little nook felt a little glum, and seemed to gasp out for a quick DIY makeover. Inspiration struck with a gift that came wrapped in lovely paper, with just enough of it to give the nook a pop of color and pattern. If you can wrap a present (even clumsily!) you can tackle this project. Measure the back wall of your recessed area, cut a piece of cardboard just a sliver thinner than the actual size, and wrap with decorative paper. 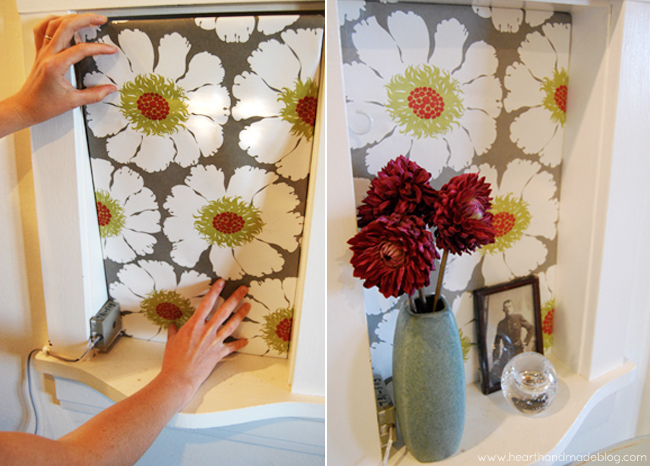 Insert, and add flowers alongside other personal objects for a rotating corner of happy! Oh isnt that lovely! I had to comment because that looks so pretty. It's amazing how one lil thing can brighten up a space!! That is so pretty! What a great idea! So cute! Great idea to wrap the cardboard rather than just tape paper directly to the wall - much neater that way. And I love how Kelly called it "Project: Nookie Wrap-up" - adorable! What a fantastic idea, Kelly--I love your "nookie wrap-up," heee hee! And it turned out so lovely! Oh that is fabulous! I love this idea and I'm totally jealous of all you recessed shelf people. =) I'll be linking. I wish my bungalow had a little phone niche like that. What a perfect little spot for flowers and a key dish!